And The Winner Is…. | Barbie Who? Here it is! I have finally decided who the first doll will be in the Barbie Who? Project. It wasn’t an easy decision, but I am confident that it is the right decision for me. The first doll will be Cofelia, also known as Miss Foster, from the episode Partners in Crime. Partners in Crime introduces us to Adipose Industries and their miracle weight loss drug that makes the fat just walk away. What they don’t tell customers is that the fat is transformed into alien Adipose children. The cute, little Adipose children are then collected and sent to their waiting parents on the Adipose 3 home world. 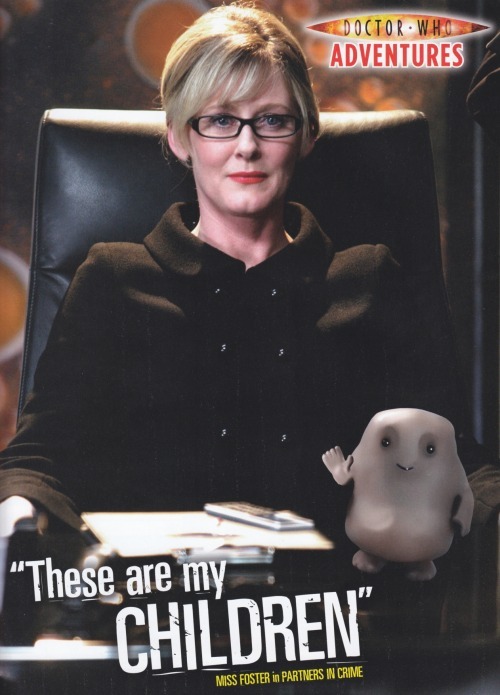 Cofelia is the head of Adipose Industries and matron to the pudgy aliens. I won’t dive any further into it for the sake of spoilers, but this episode is a fantastic adventure. Why Cofelia? Well, there are several reasons. First, she has blonde hair and blue eyes. Most Barbie dolls that I’ve found are blonde with blue eyes. It makes sense for me to make a character who matches a doll that I have a surplus of. If I mess up and ruin the doll, I have others I can fall back on. Since dolls with other hair and eye colors are harder to come by, I want to be more skilled before I work with then. Beyond looks, the other two characters I seriously considered would have been more challenging in other ways. Tegan was cut because of her hair (pun intended). Her short hair would be difficult for me to replicate on a Barbie doll. Polly wasn’t chosen because she is from the black-and – white era. It is hard to get a good read on the colors to use with her outfits because of this. I want to create something that is true to the series, so it will require more research on my part before I create any characters from the early years of the show. Right now, I don’t have the time to do that. That leaves us with Cofelia. She won’t be without challenges herself, but I feel like they are more within my reach. The two biggest curve balls for this doll will be making her glasses and doing her hair. Cofelia’s hair is in a French twist. I don’t have any combs that are her size, so I will have to improvise in some way. The glasses are black frames, so I am hoping I can make a decent rendition with polymer clay. I looked on eBay, and Barbie glasses are relatively expensive. A single pair can cost $2-$5 from the cheap sellers. Yikes! Hopefully I can DIY something at a lower cost. I have considered polymer clay and plastic canvas for the job. I will keep you posted on how it works out. In addition to that, I would also like to make a to-scale Adipose or two as accessories. I could do this in one of two ways. First, there is micro-crochet. Micro-crochet is when you use tiny crochet needles and thread to create miniature stuffed animals. I have seen pictures of creations, but I have never tried it myself. I may try my hand at it to make an Adipose. The second option is to model them out of polymer clay. This may be the easier of the two choices. We shall see which option I choose in a few weeks. This is the plan! All that is left to do is the crafting. I have to prep the doll, crochet the clothes, and make the accessories. I look forward to making the crafty updates.